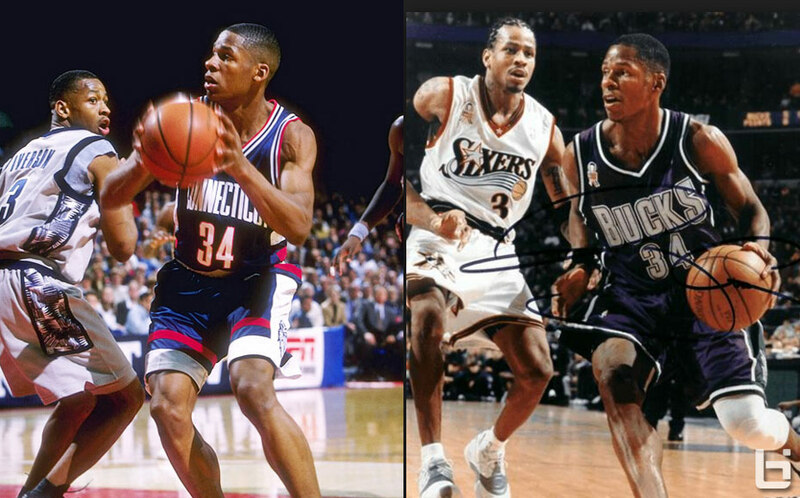 After some memorable Georgetown vs UConn battles, it was only fitting that the two biggest stars of those mid 90s teams — Allen Iverson & Ray Allen — would make their NBA debuts against each other. On November 1st of 1996, Iverson showed why he was the No. overall pick with 30 points (76ers’ debut record) and 6 assists. No. 5 pick Ray Allen only had 13 points on 3-of-10 shooting but got the W thanks to the help from future NBA All-Stars Glenn “Big Dog” Robinson and Vin Baker, as well as the great play by point guard Sherman Douglas, who put up 22 points and 8 assists against AI. The two would have many better and more memorable performances against each other. They also were part of one of the best and most controversial playoff series of all-time: the 2001 Eastern Conference Finals. The series ended with a 44-point GM7 performance by Iverson and Ray Allen accusing the NBA of rigging the series because Stern and NBC didn’t want a “small market” team to play against the Shaq/Kobe Lakers in the NBA Finals. Trivia: Did you know Spike Lee was looking to cast Iverson and/or fellow 1996 rookie Kobe Bryant as Jesus Shuttlesworth in ‘He Got Game.’ The role would end up going to Ray Allen, who people continue to call Jesus Shuttlesworth.